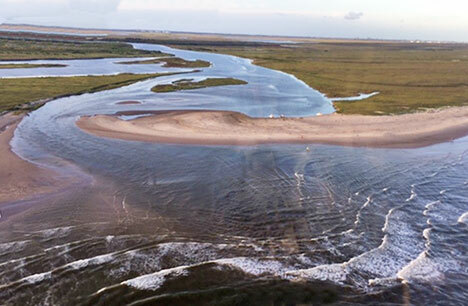 The east "beach" of the San Bernard continues its westward movement across the mouth. The west side of the river collects sand and silt from the Brazos and pushes out toward the Gulf. Water, from the recent rains, flows over the very shallow opening, too shallow for boat traffic! On August 4th, Commissioner David Linder announced at the FOR hosted Breakfast on the Bernard, the Texas Commission on Environmental Quality (TCEQ) should get funded to dredge open the mouth by the fourth quarter of this year and unless there are unforeseen events, dredging should start the first part of next year (2019). Cars park along the far west end of Bryan Beach next to the mouth of the Brazos River. After entering Bryan Beach on Quintana island, turn right and drive (4WD) as far as you can till the water stops you! You've arrived!